The merger of two neutron stars in August produced "heavy elements" and clues as to how they are produced. WASHINGTON — Do you remember what you were doing at 8:41 a.m. EDT Aug. 17, 2017? At that moment, two Gravitational Wave Observatories in the U.S. called LIGO were detecting a ripple in space time caused by gravitational waves. LIGO had already discovered several black hole mergers, but this signal was far different — it lasted 100 seconds and indicated a merger of two less-massive objects had occurred. LIGO had just detected the merger of two neutron stars. Two seconds after LIGO’s gravitational wave detection, NASA’s space-based Fermi Gamma Ray Telescope, and shortly thereafter the European Space Agency’s INTEGRAL spacecraft, also observed gamma rays. An alert went out to the worldwide astronomical community. Teams of astronomers scrambled to try to find the source of the gamma rays thought to be associated with the gravitational waves. A team of four Carnegie astronomers along with colleagues at UC Santa Cruz used the Swope telescope at Las Campanas Observatory to be the first to discover the light produced by the merger. This was the first-ever glimpse in visible light of two neutron stars colliding and pinpointed the origin of the gravitational wave signal less than 11 hours after it was detected by LIGO. This team also obtained the earliest spectra — chemical fingerprints — of the merger, which will help astronomers explain how many of the universe’s heavy elements were created. For the first time ever, observation of gravitational waves and light across the entire electromagnetic spectrum had been conducted. The source of this neutron star merger was in a galaxy called NGC 4993, located 130 million light years from Earth in the southern constellation Hydra. These two neutron stars were created by two supernovas just two billion years after the Big Bang and had been orbiting each other for 11 billion years. They were only 200 miles apart when 100 seconds later they merged to emit gravitational waves and create a kilonova that was 200 million times the brightness of the Sun. What astronomers do know is that the kilonova produced heavy elements, especially gold, platinum and uranium. Stars during their lives and deaths manufacture all of the natural elements we see on the Periodic Table of Elements other than hydrogen, which was created by the Big Bang. This process, called nucleosynthesis, continuously seeds the universe with the elements necessary to create planets and life. As an astrophysicist, what are your personal feelings about this discovery? I couldn’t be more excited knowing that on any given day a wondrous discovery is waiting to be found. Each discovery is unique and serves as a beacon to keep searching, to keep seeking, and for NSF, to keep investing in fundamental research. One of my early engagements as a young astronomer was to further multi-wavelength astronomy, or linking together telescopes around the world and in space to observe transient phenomena. This was the same theme as today’s announcement, but there weren’t gravitational waves then. We had no idea at that time how much more information could be derived by opening the gravitational wave window on the universe. What is the scientific significance of this discovery? 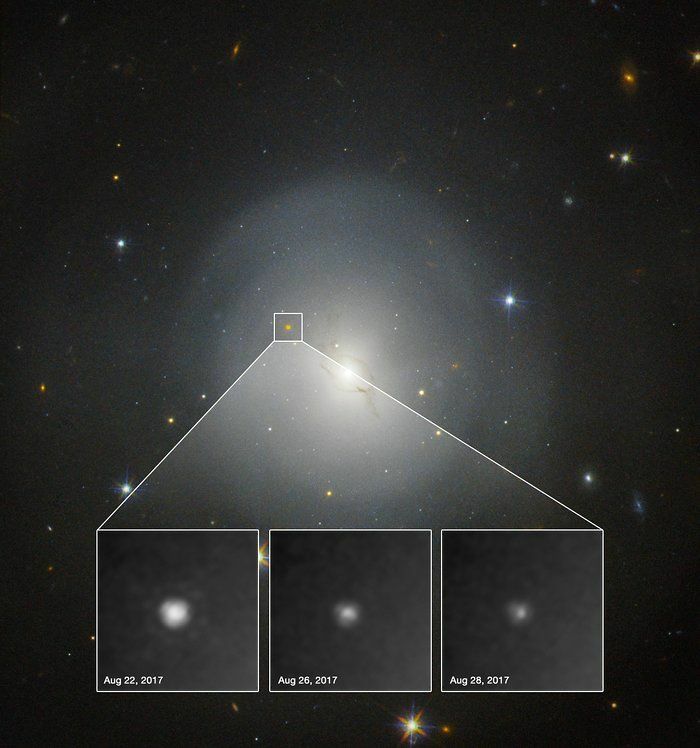 This discovery is the first verification of a “kilonova” explosion, confirming binary neutron star collisions as one source for the universe’s heaviest elements, such as gold and uranium. The fact that we can still learn about the universe is worth its weight in gold, or should I say uranium. It is also confirmation that binary neutron star infall is one way to produce short gamma-ray bursts, whose origin has been a mystery. The significance for the National Science Foundation, is LIGO demonstrates the value of funding basic research by doing extraordinarily hard engineering projects that can have profound implications for our understanding of the nature and evolution of the universe. LIGO is one of the largest experiments the agency has ever funded, and researchers at NSF’s twin LIGO detectors and the Virgo detector located GW170817 with unprecedented precision, allowing telescopes on the ground and in space to rapidly turn their attention toward the area of sky where the neutron stars collided. What do you think will be the next big discovery in gravitational wave astronomy? Not sure! [It] could be witnessing gravitational waves from supernovae, or the imprint of gravitational waves on the microwave background formed during a very early epoch in the formation of our universe. We didn’t know what the first results would be from LIGO, and we can’t truly foresee what the next results from this or other gravitational wave experiments operating at different frequencies will be. That’s the whole point of fundamental research — it can lead to new and surprising results that transform our understanding of nature and the cosmos. What is the future role of the NSF as to LIGO/gravitational wave astronomy? This was the first event in a new era of “multi-messenger” observations, a new window on the universe. Moving forward, LIGO-VIRGO will be making many more observations. With multi-messenger astronomy, scientists will observe the most powerful events in the universe, from the first gravitational-wave pulse to the cascade of particles and electromagnetic energy that streams toward Earth, offering new and more complete insights into nature’s biggest explosions. The role of NSF is to keep moving ahead to increase the volume of the universe sampled, and hence the number and perhaps kinds of sources detected; this can be done by steadily increasing the sensitivity of the gravitational wave facilities. This was a fortuitous discovery. as the LIGO observatories were due to be shut down for a year to undergo major upgrades in sensitivity that will greatly expand their capabilities. Not only that, but just nine days later the Sun would have blocked the signal. Observations will continue and more science papers will be written about this historic event, but as explained by Dr. Cordova the future is bright for multi-messenger astronomy — all you have to do is look at whatever gold you own for proof. Follow my daily blog to keep up with the latest news in astronomy and space exploration. You can also email me.